CHARLOTTE, N.C. – A North Carolina megachurch minister remains under fire for his alleged practice of instructing volunteers to strategically respond to salvation calls in order to bolster baptism numbers. Steven Furtick leads Elevation Church in Charlotte, North Carolina, one of the largest megachurches in the United States, with weekly attendance above 14,000. According to reports, Furtick performed 3,519 baptisms in the first eight months of 2013 alone, and baptized 400 attendees during a ceremony just last month. In addition to those taking note of the large number of baptisms, Furtick recently drew controversy when Elevation Church published a document entitled Spontaneous Baptisms How To Guide. The nine-page document outlines the baptism policy followed during one of its previous outreach events. Speed and efficiency are important to the baptism process, according to the Elevation Church guide. “To take the fact that we have volunteers that lead the way so people will know where to go and to act as if they were pretending to be baptized and to negate the sincere faith decision of precious people who had one of the most meaningful experiences of their life, that’s just sick!” he stated. The same day, Furtick performed a reported 400 baptisms in the auditorium. 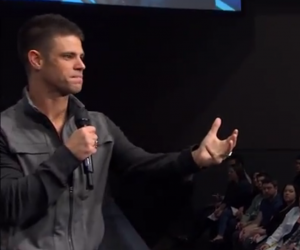 Reports of Elevation Church’s questionable baptism policy came soon after Warren Cole Smith of WORLD Magazine revealed that Furtick lives in a recently-constructed, $1.7 million mansion. “This is one of the byproducts of an evangelical movement that favors emotionalism and personal experience over doctrine, theology and biblical teaching,” Smith stated.